Cruising around on your paddle board ranges from peaceful to exciting. You can take in the sounds of nature or rip through big waves. Though there’s one paddle board activity even seasoned boarders overlook: paddle board fishing. Paddle board fishing never gets enough love, in our opinion. For some reason, most people don’t realize fishing from a paddle board is even an option. We admit it can look kinda strange to see someone paddling around the lake on what at first glance looks like a surfboard. The thing is, those people are probably about to catch the biggest fish in the lake. Fishing off of your paddle board is not only fun, but it helps catch more fish. 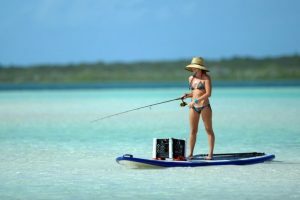 For paddle board enthusiasts or serious anglers alike, you’re missing out by not trying paddle board fishing as soon as possible. Don’t believe us? We’re bringing our best reasons why you need to try paddle board fishing today. 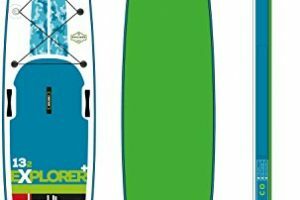 Get paddling out the gate with the impressive California Board Company 11′ Angler Fishing Stand up Paddle Board. CBC makes top notch paddle boards and this conventional board showcases their attention to detail and quality. V-haul including racks for both your rod and your gear. Get started now! Any good angler will tell you that looking down into the water to spot fish makes your day a whole lot more productive. Actually seeing the fish you’re targeting makes fishing much easier. Think about it; you can drop the lure right in front of the fish’s mouth. This is where paddle boards have a huge advantage over other forms of on water fishing. You’re standing the whole time, so your view into the water is unrivaled. If you’re out fishing and the water’s clear, the guy on the paddle board will probably catch the most fish. We should also mention that anyone interested in paddle board fishing should purchase a pair of tinted fishing glasses. Sunny days make the glare off the water unbearable and ruin any chance you had to see fish. Though throw on some shades and it’s a non-issue. Lugging around your boat or heavy kayak isn’t fantastic when you’re searching for fish in remote areas. And usually these hard to reach places offer the best fishing. This is where paddle boards provide another huge advantage. They’re so light and maneuverable that you can take them virtually anywhere. Sure, there are heavy paddle boards, but you also have options. 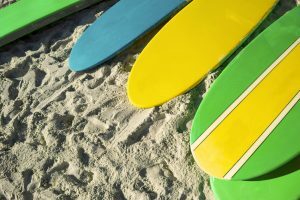 Inflatable boards are extremely light, and even shorter boards don’t weigh much. If you’re really traveling light you can even ditch the cooler at home (where everyone sits down). Yeah, your legs might get sore, but the fishing is worth it. Loud boats and splashing waters keep fish away. Our aquatic targets can feel vibration through the water and swim away when they sense your presence. Stealth fishing is what first got kayaks into the hands off anglers everywhere. When you’re choosing between outboard motors and silent paddles, the paddles win every time. This same logic applies to paddle boards. 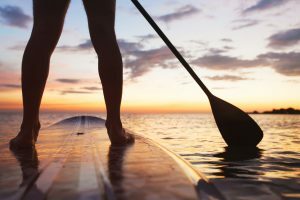 Gliding through the water on your paddle board is silent. The fish won’t know you’re coming. 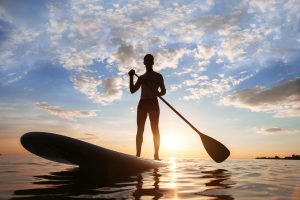 Why are we advocating for paddle boards and not their more stable cousins, the kayak? Because of the combined benefits paddle boards offer. Sure kayaks offer equal stealth, but they also weigh more and give no vantage point. Paddle boards are just better equipped for fishing. Everyone envisions fishing either on the ocean or sitting on the lake relaxing. Neither image is necessarily wrong, but not at all what paddle boarding is about. Just getting to your fishing spot is a full body workout when you’re cruising on your paddle board. 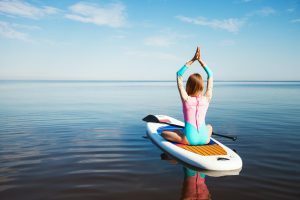 Balancing engages your core, while paddling works your arms and back. Some people might not enjoy this idea, but we think it’s excellent. How often can you go fishing and stay in shape at the same time? Paddle board fishing takes an otherwise sedentary activity and turns it into something more active (and more active = more fun in our opinion). Call us biased, but tooling around the water on a paddle board is just way more fun than kayaking or driving a boat. When you think about it, you’re pretty much walking on water. Once people get the hang of paddle boarding they start to realize just how cool the concept is. Paddle board fishing also lets you have a little fun if the fish aren’t biting. Want to take a swim? Just roll off your board, and then hop back on. You won’t have to worry about climbing back into a boat. Then there’s the fact you don’t actually have to fish every time you feel like paddle boarding. Leave the pole at home and just go out for a relaxing day on the water. Or strap your fishing pole to the board and fish on a whim. That’s the beauty of paddle boards; the freedom and versatility they offer are unmatched by any other watercraft. Paddle board fishing is just too much fun for us to not recommend. And, it’s also way more efficient than fishing from other types of watercraft. Really you’re getting the best of both worlds. Paddle boards are (in our mind) the obvious option for both dedicated anglers and people looking for a great workout. 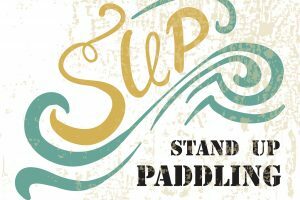 The ability to spot fish, easily move your board, stay silent, and stay in shape really sets paddle board fishing apart. You’re getting the best fishing experience, while also all the benefits paddle boards have to offer. 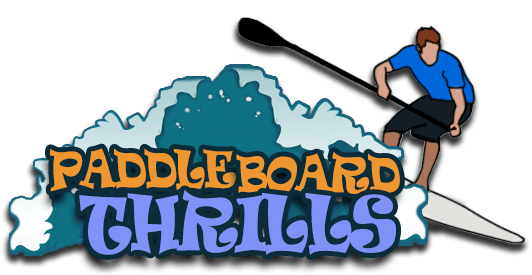 If you’re looking for more information surrounding paddle boards, follow our blog. We offer both advice and reviews for beginners and experts. Our goal is to explain which board is right for which occasion. You want a quality board, at a price you can afford. We can help! Each board type works best under different circumstances. The board you’d want to take fishing may not be the board you’d want to rip through some waves. And if you’ve got a question about a board, or need advice that we haven’t already covered, get in touch with us.